The tale of Giselle is a sorrowful tale. A peasant man loves a beautiful peasant woman named Giselle, but a prince dressed as a peasant catches Giselle’s eye. When it’s reveal Giselle’s love is a prince, and already arranged to marry another, Giselle goes mad, killing herself with the prince’s sword. After her burial, she becomes a Wili, a sylph-like spirit destined to dance from midnight until dawn every night, luring men to dance with her until they collapse to death from exhaustion. The peasant who loved Giselle falls to this fate by other Wilis, while the prince finds himself enticed to dance with the Wili, Giselle. There are different endings to this story, one where the prince falls over and dies, one where he survives, but is left alone and heartbroken, and one where he survives, and goes off to marry the one with whom he was engaged. Another version has the prince not in love with Giselle, but simply toying with her for his own enjoyment. To me, the true sad story is that of the presant man who loved Giselle, found jealously as she fell in love with another, and died in a dance with the other Wili on his way in search of Giselle’s grave. The fate of a woman deceived by the one she loves, and whom dies before her wedding day, is to become a Wili. This is the fate Giselle knows, and it is the basis of the story in 4.AKT of Princess Tutu. It is title and subtitle for 4.AKT. The narrated story is set to the sound of Kaoru Wada’s “Introduction”, a piece written specifically for use in Princess Tutu. During the advanced class’s practice, the piece played on the piano is “Entrée de Giselle” (“Entry of Giselle”), from Act I, no.4 of Adolphe Adam’s ballet, Giselle. As it’s the theme music for the striking of the clock tower, Léo Delibes “Waltz of the Hours”, from Coppélia plays here. It continues through the start of Fakir’s questioning Mytho on what he’s thinking. The well fitting “Wedding March” from Felix Mendelssohn, for William Shakespeare’s play, “A Midsummer Night’s Dream”, reprises its role as Mr. Cat’s theme music. A soft “Miniature Overture”, from Peter Tchaikovsky’s The Nutcracker, plays as a backdrop to Duck’s recalling what Rue said about Princess Tutu being a storybook character, and reconciling her own reasons for recovering Mytho’s heart. This is Duck’s theme, after all. I have no idea what the “M14A pf” part means, but Wada Kaoru’s “Etude”, written for Princess Tutu, plays as Duck continues to practice ballet moves during detention. As an étude is a piece written to practice by, its purpose as music is revealed by its simple name. It was in 3.AKT where Charles Camille Saint-Saëns’s piece from the The Carnival of the Animals suite, “Aquarium”, was introduced while the story of Mytho as a prince and Tutu as a princess from a storybook are told. 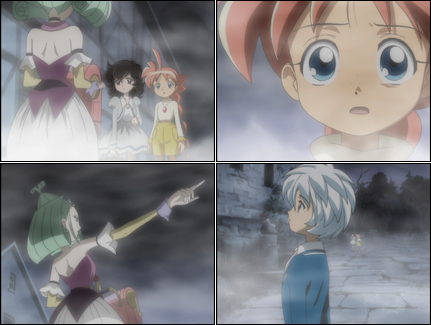 The music returns here as Rue tells Mytho he has no need for a heart, confirming that not only Fakir, but Rue also knows about Mytho’s lack of a heart, and perhaps knows of his origin as a storybook prince. It plays through Fakir’s arrival, and his conversation with Rue. This time it’s “M14″ without the “A pf”, as another “Etude” piece by Kaoru plays during Duck’s continued ballet practice scene, as Pique and Lilie arrive to see how she’s holding up. The étude plays again as Pique and Lilie join in Duck’s practice. Finally, the étude is heard as Mr. Cat tells Duck she’s off probation, and may return to the beginner’s class. A haunting “March”, from Tchaikovsky’s The Nutcracker, and typically Drossylmeyer’s theme music, plays after Mytho vanishes in the wind. Duck and Rue talk as this piece plays. Tchaikovsky’s “March” is heard in its original form during the eyecatch scene. Duck’s theme, Tchaikovsky’s “Miniature Overture”, plays as Rue and Duck talk about how forward Duck is with calling Mytho and Rue by their given names alone. Miss Edel’s established theme is “Music of the Automatica”, from Léo Delibes’s ballet music for Coppélia. Paying no to attention to the impatient Rue, Miss Edel tells the tale of the young maiden who loved a nobleman, but was unable to have his love in return, due to their difference in status. During this time, “[title unknown]” from Adolphe Adam’s Giselle plays. It goes on as Duck and Rue hurry to the courtyard, where they find Mytho being surrounded by spirits. Note: For this piece, Wikipedia and various CD compilations of the music to Giselle all break up the music differently, with different titles. Can anyone confirm the title to this piece, which plays when Albrecht visits Giselle’s grave? The deceased maiden’s ghost calls to Mytho in dance, echoing the scene of Giselle where the Wili take the peasant, Hilarion, as their dance partner in “[title unknown]”. It plays as Rue and the Giselle-like maiden compete in dance for Mytho, ending with Rue’s collapse. Note: Likewise the title of this piece (a pas-de-deux?) when Hilarion is confronted by the Wili. Any help on this one? 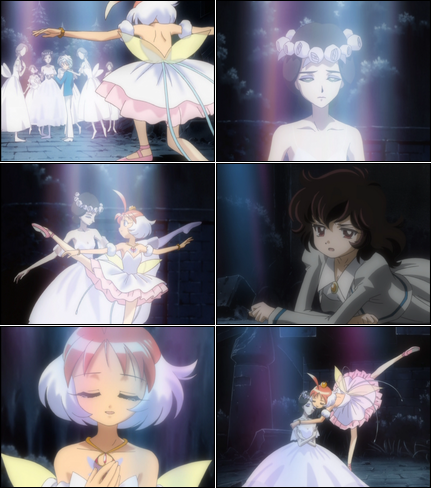 The prior piece transitions to “scene et fugue des Wilis” or “Scene of the Fleeing of the Wilis”, as Princess Tutu invites the maiden to dance, and soothes her aching heart. Note: I don’t know if “fugue” is meant as a musical “fugue” or if it is intended as meaning “running away”. If anyone knows more about this piece’s title, I’d be appreciative to hear about it. 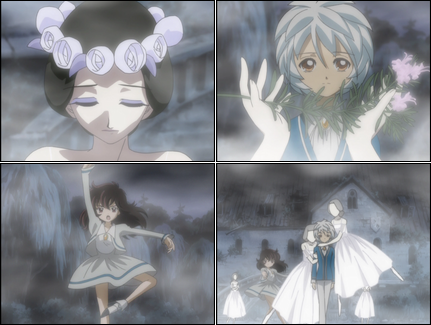 Finishing the scene is to the sound of Felix Mendelssohn’s “Auf Flügeln des Gesanges”, or “On Wings of Song”, as Princess Tutu returns to Mytho his lost heart shard. It ends with Drossylmeyer’s warning of returning to Mytho all his pain-bringing emotions. Preparing for the next episode is a gathering of scenes before Modest Mussorgsky’s “Catacombae”, the eighth piece in his suite, Pictures at an Exhibition. This is my favorite episode. Thank-you for the analysis. Princess Tutu play many very famous waltz but I could never really name them. On the fugue part, I think it could mean both since Giselle is running away from her sorrow and other meaning would be self-explanatory. Thanks for your thoughts on the fugue part; it’s difficult to translate things like that, and you’re probably right about it meaning both. Hopefully the next episode’s music will be easier for me to find the specific musical piece titles for! Ummmm this episode of “Princess Tutu” is also my favorite. By the way the title of the unknown part where Rue dances with the wilis is “scene des wilis; hilarion enters” or that how i know, i am not really sure by the way thank you again for all this valuable data. I love these so much, thank you for doing this!